The NFL Spring Meeting at the Ballantyne Hotel concluded with mixed messages after team owners and league executives debated an array of topics. Commissioner Roger Goodell remains cool to Las Vegas, but the climate appears to be changing. CHARLOTTE, N.C. — NFL commissioner Roger Goodell is resisting any urge to throw a party for Las Vegas. The NFL Spring Meeting at the Ballantyne Hotel concluded with mixed messages after team owners and league executives debated an array of topics. Goodell remains cool to Las Vegas, but the climate appears to be changing. “I just think the obvious, that Las Vegas is a very attractive place,” Jones said. “It’s one of our nation’s real jewels, it’s an asset, it’s unique, it’s American. And all of that, in my eyes, is what the NFL aspires to be associated with. It’s a great entertainment environment, and I think that far overshadows any issue to do with gambling. The league awarded future Super Bowls to Atlanta, Miami and Los Angeles, but Goodell gave no indication he’s ready to move the Raiders to Las Vegas, explaining that he needs to see a formal stadium plan and more information on the market in general. On April 28, Davis vowed to move his team to Las Vegas. Last month, a plan to finance a 65,000-seat stadium near the Strip was presented to the Southern Nevada Tourism Infrastructure Committee. The project would be funded through a public-private partnership including the Raiders, Las Vegas Sands Corp. and Majestic Realty. The current proposal calls for $750 million from taxes on tourists and $650 million from private sources. The Raiders would contribute $500 million, including a $300 million loan from the NFL, with Las Vegas Sands/Majestic Realty adding $150 million. The SNTIC meets again Thursday to discuss the stadium’s financing. In January, the league denied the Raiders an opportunity to return to Los Angeles, instead allowing the Rams to move from St. Louis to the nation’s second-largest market. Davis said the Raiders are doing demographic research on Las Vegas’ viability in supporting a team. Las Vegas would be the NFL’s fifth-smallest media market — ahead of Green Bay, Buffalo, New Orleans and Jacksonville — but it’s also a marquee tourist destination, as Jones and Rams owner Stan Kroenke each emphasized. 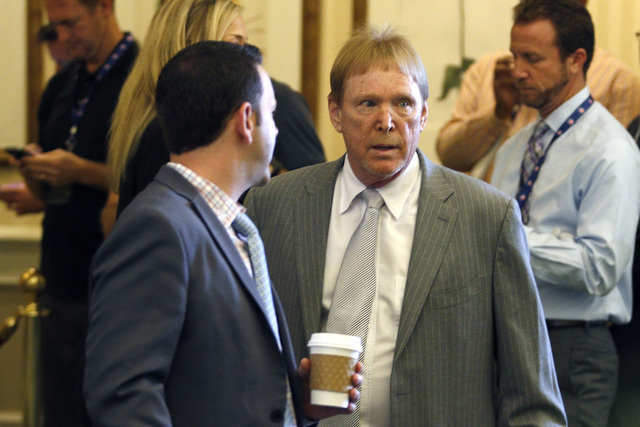 With powerful owners such as Jones, Kroenke and the New England Patriots’ Robert Kraft in his corner, Davis expressed confidence he can get the votes needed from 24 of 32 owners to relocate his franchise. But he said he has not surveyed a majority of the owners. “I haven’t heard ‘No,’ let me put it that way,” Davis said. Still, Goodell said he prefers the Raiders remain in Oakland in a new stadium, and he made it clear he won’t entertain many more Las Vegas questions until the NFL sees the stadium financing plan. “It’s very premature at this point,” Goodell said. “Until we have more information, it’s pure speculation. There’s a great deal of work that needs to be done.